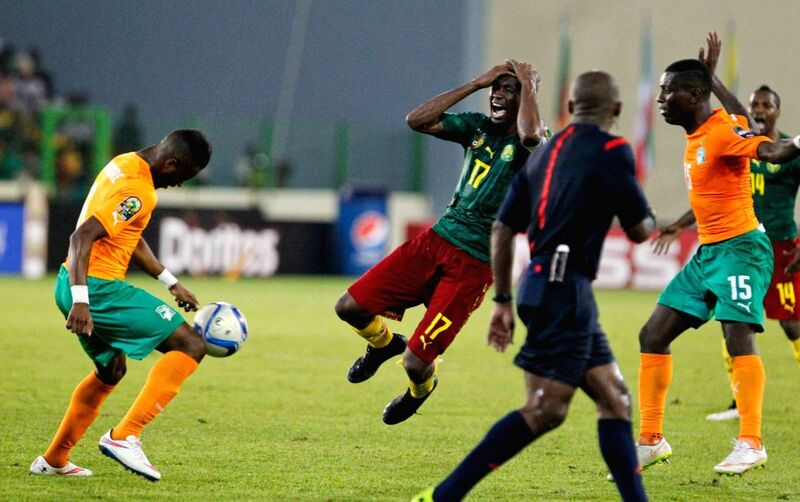 MALABO, Jan. 29, 2015 - Stephane Mbia Etoundi of Cameroon shouts during the group match of Africa Cup of Nations against Cote d'Ivoire at the Stadium of Malabo, Equatorial Guinea, Jan. 28, 2015. Cameroon lost 0-1. Aboubakar Vincent Aboubakar (R) of Cameroon vies with Siaka Tiene (L) of Cote d'Ivoire during the group match of Africa Cup of Nations at the Stadium of Malabo, Equatorial Guinea, Jan. 28, 2015. Cameroon lost 0-1. Max Alain Gradel of Cote d'Ivoire shoots to score during the group match of Africa Cup of Nations against Cameroon at the Stadium of Malabo, Equatorial Guinea, Jan. 28, 2015. Cote d'Ivoire won 1-0.